When I decided to make my own up-cycled wool diaper covers for my third child I realized that it would be foolish to use disposable baby wipes after the effort I had under taken to avoid disposable diapers. I was looking at a lot of cotton fabric remnants from the t-shirts used to make pre-fold diapers and decided to go for zero waste by using the remnants to make my wipes. The cloth baby wipes are a simple 8 by 8 inch square of 100% cotton t-shirt material leftover after cutting my diaper off the bottom of the shirt. I had the idea that I was going to try to finish the edges of the squares but time constraints prevented that task from being accomplished. After repeated use and washes I am glad that I didn’t invest the time to finish the edges. It was an unnecessary detail. Sure it would make the wipes look better but it didn’t affect the functionality. The edges have curled a bit after repeated washes but have not frayed. Small hand sanitizer bottle for travel. All work wonderfully! The recipe is very simple and can be thrown together very quickly with only four simple ingredients. Mix in large jar. 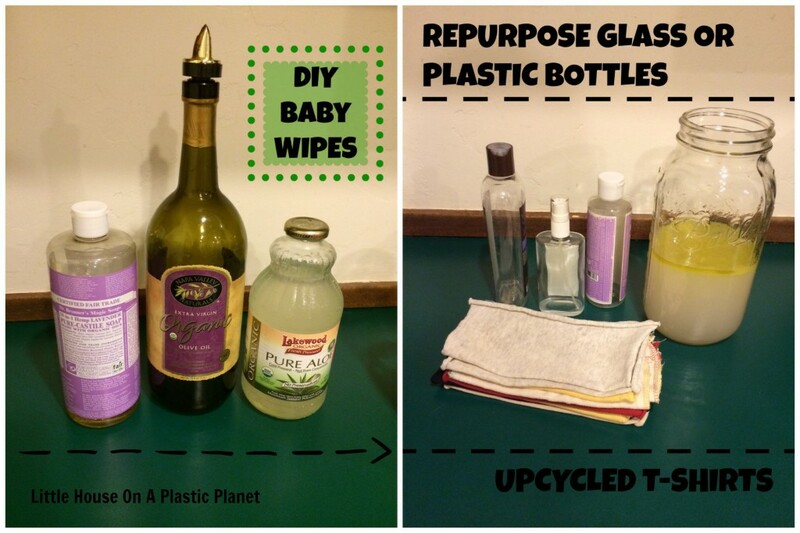 Repurpose a shampoo or dish soap container as the squeeze bottle for the solution. I keep the dry wipes with a bottle of the solution and wet the clothes before use. My baby has not had one diaper rash yet!